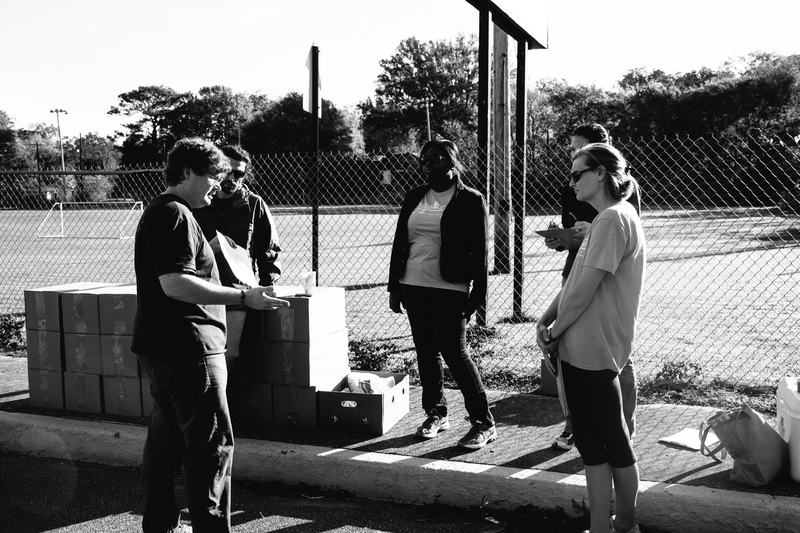 As Assistant Director at the Community Food Bank of Central Alabama, you will often find me speaking about the work we do or giving tours at the Food Bank. 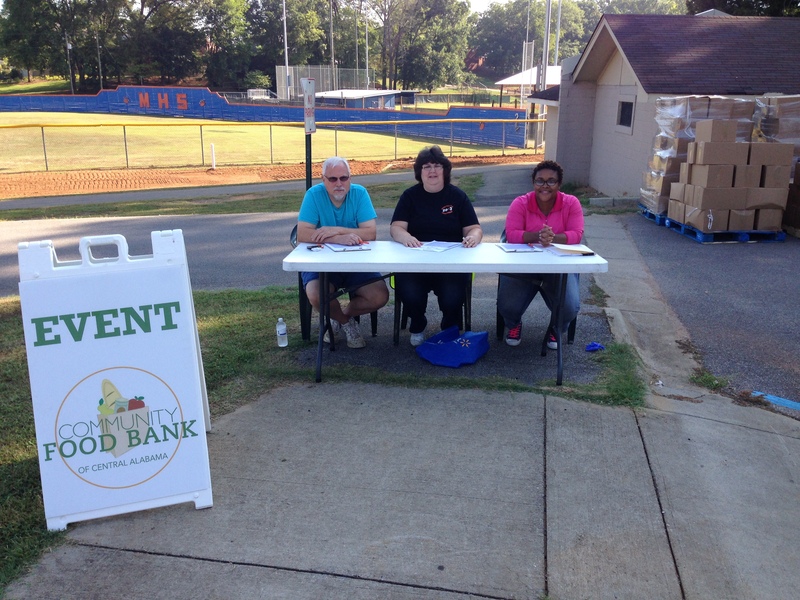 Here’s a brief synopsis of what I say: The Food Bank secures and distributes close to 10 million pounds of food each year to go to families in need. “Families in need” may seem like a broad term, but we know that 1 in 5 adults and 1 in 3 children currently live in poverty across our 12-county service area. And though many folks who live in poverty also struggle with chronic hunger, we also know that there are many families that may not fall in the previous mentioned category. Instead, they may be facing an unexpected diagnosis (something I have seen and lived firsthand this year), a layoff, a divorce, or just working two jobs but still can’t seem to make ends meet. I often think about the kind of decisions I have to make on a weekly basis: big decisions on purchases I’ve been saving to buy, how to budget for the week and stretch our meals, anticipated child care costs, utilities, medicine, and everything else in between. I spend a lot of time thinking about those things and I’m in a position where I’m not necessarily having to choose BETWEEN all of those things each and every month. In other words, I can’t imagine how families that are having to choose BETWEEN all of those things on a monthly basis must feel every day. It is all consuming and overwhelming. So as a Food Bank we are in a very important position to supply emergency food to people who are not always in a position to choose FOOD when making the decisions between food and medicine or food and rent. Sure, I wish there was a way we could solve both: provide emergency need while also eradicating the need altogether. However, we know that it is much bigger than that and hopefully our community can work together to make a dent in figuring it out on behalf of families and children we serve. One of the main ways we reach people is through partner agencies. These agencies are located in communities/neighborhoods all over our service area and they get food from us and then give it to the families they serve. This is the main way we get food out of our doors and in communities, but we also know that we are missing many folks in the process. 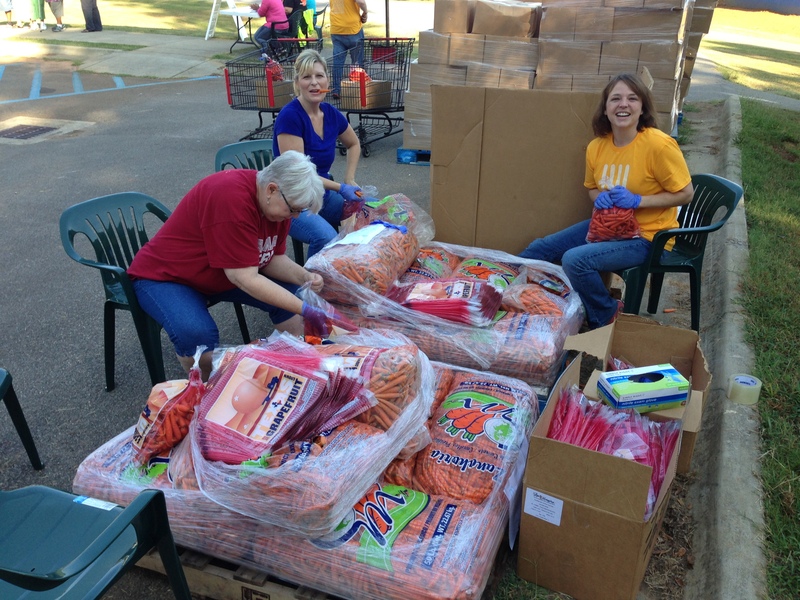 Hence our Mobile Pantry Program. 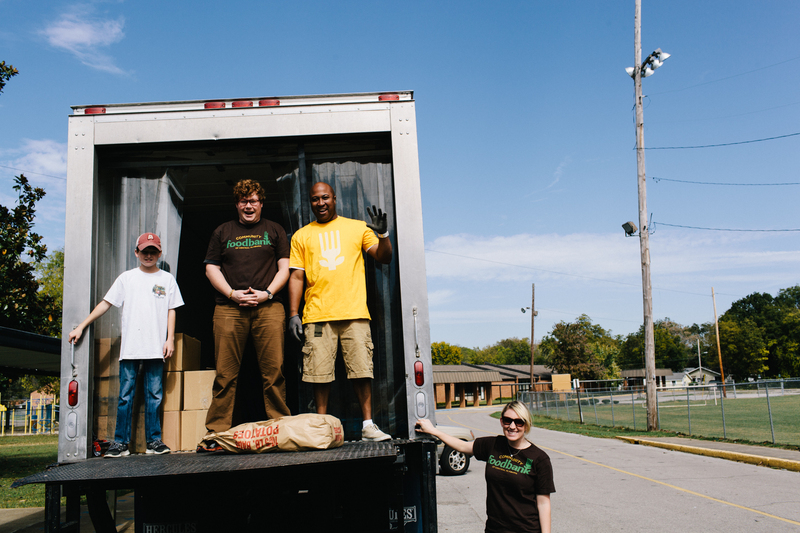 A Mobile Pantry distribution happens when we load our refrigerated trucks with 40-lb boxes full of non-perishable items and then we add pallet of fresh produce/fruit (think 10-lb bags of potatoes, onions, carrots, or apples). When we arrive at a site, we unload! Volunteers receive instructions when they arrive and also help at the registration/welcome area. 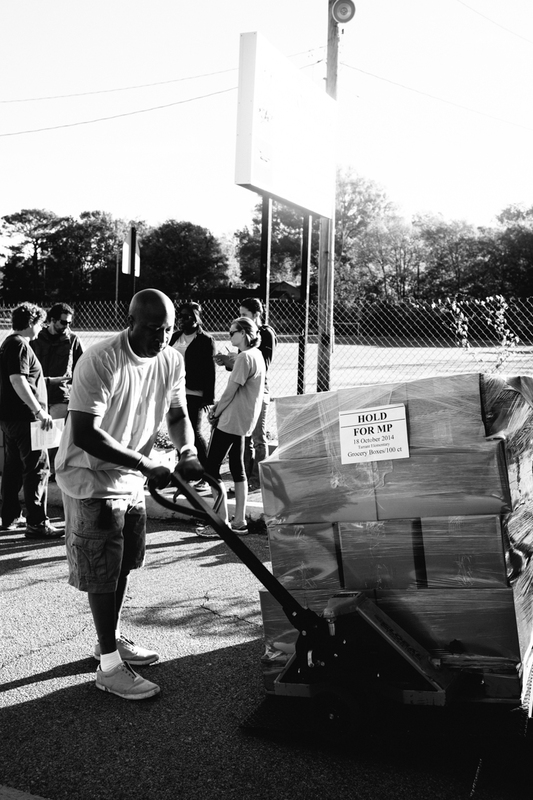 Most volunteers assist each family with carrying their boxes/bags back to their cars. This is a vital need given the fact that we serve around 100-150 families at each distribution. Eventually, we hope to incorporate nutrition classes, taste testings, and additional resources for families. Until then, we just need your help to get the food out as best we can. This Thursday (and every last Thursday of the month), we host a distribution in Shelby County at the Boys & Girls Club in Montevallo, Alabama. Volunteering only takes approximately 2 hours (3 hours max). If you are available, please consider helping us out! We gladly take individuals, faith-based groups, and corporate groups! 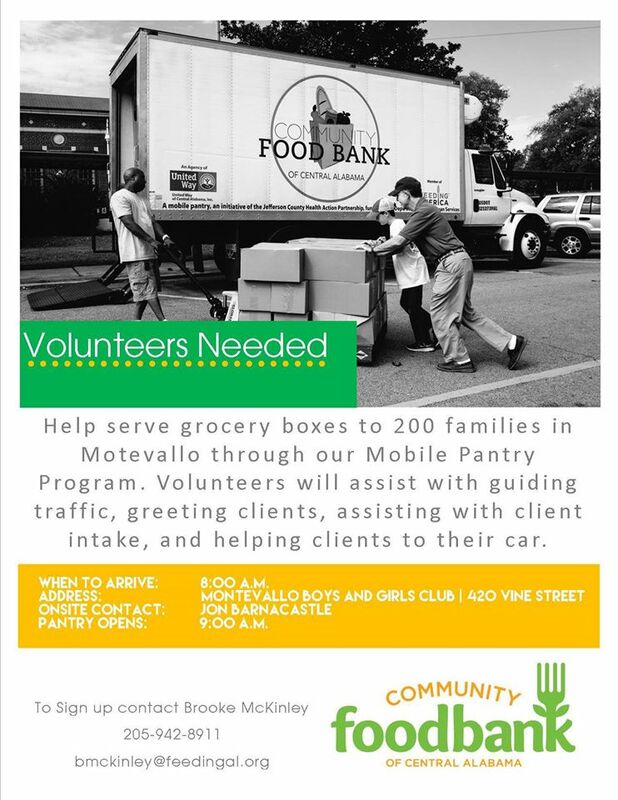 We have limited space, so be sure to email my colleagues Brooke McKinley (bmckinley@feedingal.org ) or Jon Barnacastle (wjbarnacastle@feedingal.org) before showing up. We especially need your help THIS Thursday, so please holler now if you are interested! I think you’ll enjoy these events — especially as we approach the holidays. Even if you can’t make it this Thursday, please reach out to me or Jon if you want to be on a list for future opportunities. Our super fantastic team would love to work with you in the future. Have I mentioned how much I seriously love and appreciate this team?